MID2PianoCD is a software utility for Windows which allows you to encode MIDI and ESEQ music files into the special audio formats required by several types of electronic player piano systems. These formats are typically found on CDs in which one audio channel contains audio accompaniment while the other audio channel contains a digital control track for the piano (sometimes referred to as "analog MIDI"). Some newer player systems, such as the Live Performance LX and PianoDisc iQ systems, also permit playback from an iPod or other MP3 player loaded with specially-encoded MP3 files. Using MID2PianoCD, you can create your own CDs and MP3 files in the appropriate format to expand the music library of your piano. Steinway & Sons acquired the Live Performance LX system and reintroduced it as Spirio in 2015. In MID2PianoCD, select Live Performance LX format. This low-cost player system is compatible with PianoDisc, Pianomation and Disklavier formats. To encode material for it using MID2PianoCD, select Disklavier format for best results. These are customized QRS Pianomation systems. To encode material for them using MID2PianoCD, select Pianomation MIDI format (or for slightly more accurate results, PianoDisc Classic format). QRS PNOmation II is currently not supported, due to QRS' use of DRM to disable playback of unauthorized third-party content. All piano+audio music for PNOmation II must be purchased directly from QRS and will be locked to the system's serial number. Those who wish to create content for PNOmation II must make special arrangements with QRS. Pianomation MIDI tracks encoded with MID2PianoCD can be played on PNOmation II by contacting QRS and requesting an Unlock Code and Release Key to disable the DRM for your system's serial number. No documentation is included with MID2PianoCD, but you'll find that it is extremely easy to use. The general idea is that you use MID2PianoCD to convert MIDI and ESEQ files into specially-encoded WAV or MP3 files. You then either burn a set of WAV files to an audio CD to play on the piano's CD player, or you copy the set of MP3 files to your MP3 player to stream directly to the piano via its audio input jacks. Locate the WAV files MID2PianoCD generated, and use any CD-burning package (EZ CD Creator, Nero, etc.) to burn an audio CD-R or CD-RW from them. Use Disc-At-Once mode to burn the CD, if available, and be sure to close the session. Do not create a data CD (i.e. a CD with files and directories on it) or the disc will not play on your piano. Locate the MP3 files MID2PianoCD generated and tag them (add titles and other embedded information) using your favorite MP3 tagging software (MP3Tag is a great tool for this). Copy the encoded, tagged MP3 files to your MP3 player just like any other MP3 files, connect the MP3 player to your piano's audio inputs, and play the files. If you'd like to create music tracks in which the piano accompanies an audio recording (as on some of the commercial CDs for these player systems), place a WAV audio file of the accompaniment in the same directory as the MIDI file. If MID2PianoCD finds a corresponding accompaniment WAV file, it will automatically merge the accompaniment into the encoded output WAV file with correct synchronization. The general procedure to create appropriate MIDI and WAV files for input to MID2PianoCD is to use a software package like Sonar to make the recording, recording both MIDI and audio into the same timeline. After editing the performance, export the MIDI and WAV files from the project separately, and use them as inputs to MID2PianoCD. Recording and editing the files together will ensure that proper sync is maintained throughout the editing process. Have the singer wear headphones. Play the MIDI file back through the headphones (i.e. NOT on the acoustic piano) and lay down a new 44.1 KHz mono WAV recording of the singer (by herself) as she sings, accompanied by the pre-recorded piano accompaniment she is listening to in the headphones. Export the MIDI and WAV files from the timeline and use them as inputs to MID2PianoCD. Two applications which work well for the purpose of mastering piano+audio recordings are Powertracks Pro Audio and Cakewalk Sonar. When encoding piano+audio tracks to accompany digital video of a performance, you will need to delay the video by exactly one second relative to the encoded audio to achieve proper synchronization. MID2PianoCD has the ability to automatically apply id3v2 tags to the MP3 files it creates. This can save some time if you are preparing sets of files for multiple player systems. To use this feature, place a list of id3v2 tags, one per line, in a UTF-8 text file in the same directory as each MIDI file. This file must have the same base filename as the MIDI file but with the extension ".tags.txt". You can use this sample tags file as a template; just edit it in Windows' Notepad utility and replace the sample text in each field with the desired text for each tag. Do not change the four-letter tag IDs at the beginning of each line. If you have no text for a particular tag, either leave the text area blank or remove the entire line. You may add additional tag IDs to the file as long as they adhere to the id3v2.3 specification. To achieve the best results when encoding MIDI files with MID2PianoCD, it is important that you select the correct source velocity profile in the Advanced menu of MID2PianoCD. This ensures that the dynamic range of the source material will be converted properly for playback on your particular player piano system. If you believe the material you are converting was designed for a Yamaha Disklavier (and thus contains MIDI note velocities ranging from approximately 30 to 95), select the Disklavier source velocity profile. For most other piano material, select the "Full Range" source velocity profile, which assumes the source material will use the full range of MIDI note velocities (1-127). A useful tool for inspecting a histogram of velocities appearing in a MIDI file is Anthony Robinson's Veloset. If the performance sounds bland, with minimal expression (the resulting dynamic range is too narrow) you have probably encoded Disklavier material with the full-range source velocity profile. Reconvert using the Disklavier source velocity profile. If the performance sounds too extreme, with excessive expression (the resulting dynamic range is too wide), you have probably encoded full-range material with the Disklavier source velocity profile. Reconvert using the full-range source velocity profile. Note that MID2PianoCD will automatically select the Disklavier source velocity profile for all ESEQ files (a Yamaha-specific file format typically used only with Disklavier pianos). When encoding to Live Performance LX, SE, and QRS Pianomation 1 formats, MID2PianoCD will automatically convert high-resolution MIDI files containing Yamaha's XP extensions (recorded by Disklavier Pro systems) to equivalent high-resolution data for each of these player systems. High-resolution XP MIDI files can be found at Yamaha's International Piano E-Competition Site. MID2PianoCD is available for free. But if you find it useful, please consider making a contribution to offset my costs and encourage further development. Suggested amounts: USD $35 for personal use, $250 for commercial use. Commercial use is defined as using the software to produce CDs or MP3 files for sale to others (including through sites such as eBay) or for promotional purposes (for example, to provide pre-encoded material to customers as an incentive to purchase a player system). MID2PianoCD contains no advertisements, spyware, crippled features, nagging, or other such junk, so I rely strictly upon user contributions to cover my time and expenses in developing this tool. Special thanks to WebOnlyPiano, a pioneer in producing third party piano+audio recordings and a major contributor to this project from 2005-2006. Also, thanks to the handful of individual users who have elected to make contributions. Your support is essential to the future development of this software. This is the Windows version wrapped in Winebottler, enabling it to run on MacOS X (experimental). There are some cosmetic issues, but the output is correct. This program is designed for Windows 10/8/7/Vista/XP and has been confirmed to run properly in Ubuntu Linux under WINE. It should work fine in other Windows emulation environments (Parallels Desktop, etc.). When encoding MIDI and ESEQ files, MID2PianoCD will automatically remap all piano parts to MIDI channel 1, as required for broadest compatibility with electronic player piano systems. This automatic modification is sufficient for most files. However, if your music files require more extensive modification to play properly on your piano system (for example, because NO channels are specified as piano parts), you will need to fix the files manually using MIDI sequencing software before you encode the files with MID2PianoCD. When editing files, be sure to use MIDI channel 1 only for piano parts. It is not necessary to convert Type-1 MIDI files to Type-0, since MID2PianoCD supports both types, and this distinction is lost in the encoding process anyway. Also, it is important to understand that some of the formats supported by MID2PianoCD have considerable limitations. The primary constraint is that they offer much less bandwidth than a wired MIDI connection. For complex MIDI streams, this can result in chords becoming slightly arpeggiated due to the serial transmission of note events at a much slower data rate. Some encodings have further limitations. For example, the Pianomation and Pianocorder encodings reduce the subtle expression in the music data by encoding far fewer note velocity levels than the 127 levels MIDI supports. For the best timing and full expression: Play a MIDI or ESEQ file from floppy disk or memory disk, directly on the piano's control unit (note that Baldwin ConcertMaster and QRS Serenade Pro units also support playing actual MIDI files burned to a data CD, and the results will be far superior to playing an "analog MIDI" version of the same file). For decent timing and full expression: Connect a computer to the MIDI IN or TO HOST port of your piano's control unit, and use MIDI file jukebox software such as vanBasco's Karaoke Player to play MIDI files on the piano. Despite these limitations, the CD formats are very convenient to use, and for casual listening, the results are often quite acceptable. They are the most convenient solution if you want to combine a piano performance with a live audio recording. The Live Performance LX, SE, and Pianomation 1 formats are excluded from the above discussion. They use a more sophisticated streaming data format that is immune to these problems. Ensured that key aftertouch messages are not stripped when encoding Disklavier velocity profile material to Disklavier format, so that XP Mode recordings and silent note effects are left undisturbed. 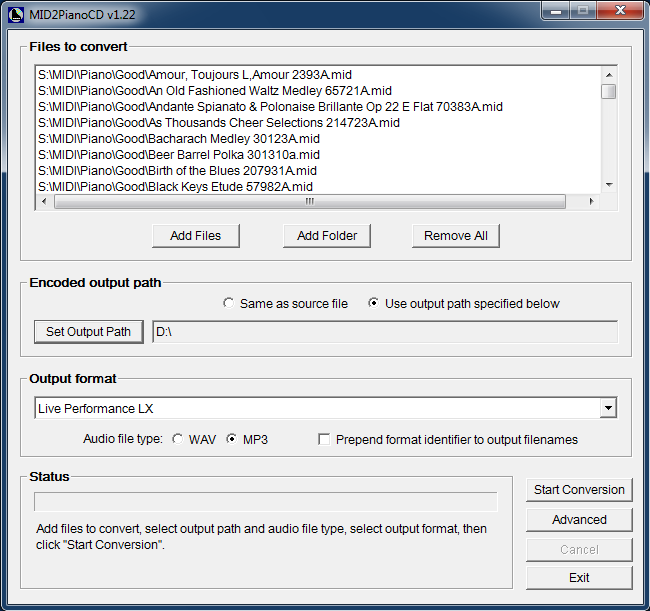 MID2PianoCD uses the open source LAME engine for its MP3 encoding support. This software and web site are not affiliated with Yamaha, PianoDisc, Baldwin, QRS Music, Live Performance, Pianoforce, Suzuki, Marantz, Superscope Technologies, Steinway & Sons or other companies mentioned. All trademarks are the property of their respective owners and are mentioned strictly for informational purposes.